The Canberra Class Amphibious Assault Ship (LHD), also known as a Landing Helicopter Dock, provides the Australian Defence Force with one of the most capable and sophisticated air-land-sea amphibious deployment systems in the world. These 27,000 tonne ships are able to land a force of over 1,000 personnel by helicopter and water craft, along with all their weapons, ammunition, vehicles and stores. 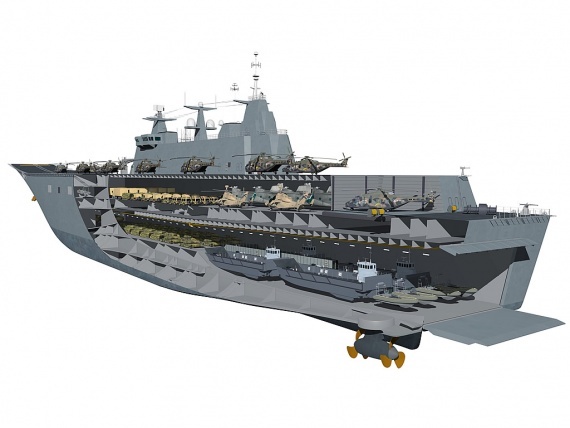 The Canberra Class Amphibious Assault Ship concept. 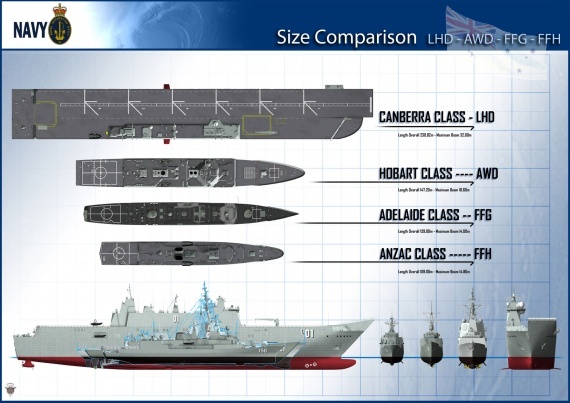 The largest ships ever built for the Royal Australian Navy, the LHDs were built as a collaboration between Navantia and BAE Systems - Maritime. The ships were constructed using the modular approach whereby the ship is divided into modules, which were built and fitted out as discrete units, before being welded together to form the completed ship. This allowed the ship to be built at a number of different sites across the shipyard before being brought together for final joining. Construction of the hull to the level of the flight deck, including the majority of fitting out was undertaken at Navantia's Ferrol-Fene shipyard in north-west Spain. The hull was then shipped to BAES' Williamstown shipyard in Victoria for the installation of the island structure. The island modules were constructed at a number of sites around Australian before they were moved to Williamstown for final installation on the flight deck. The first LHD, HMAS Canberra, commissioned on 28 November 2014 and the second ship, HMAS Adelaide, commissioned on 4 December 2015. The ship is a conventional steel mono hull design with the superstructure located on the starboard side of the flight deck. There are four main decks: the Well Dock and Heavy Vehicle Deck for heavy vehicles and/or cargo; Main Accommodation Deck, including the Primary Casualty Reception Facility (PCRF); Hangar and Light Vehicle Deck for light weight vehicles and cargo; and the Flight Deck. 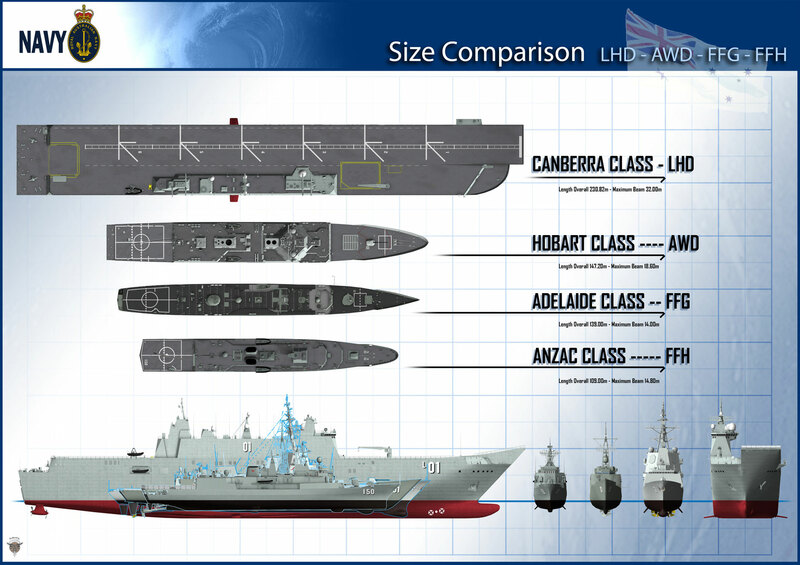 The LHD has been designed with the shallowest possible draft to allow her to operate in secondary ports and harbours as well as manoeuvre tactically in the shallow waters common in the littoral regions. Maximum speed is in excess of 20kn with a range of 6,000nm, a sustained maximum speed of 19kn under full-load conditions and an economic cruising speed of 15kn with a range of 9,000nm. She can also reverse with full directional control at up to 8kn. The LHD has a stern ramp/door that provides access to the well dock for landing craft and vehicles along with a fixed ramp (steel beach) between the well dock and the heavy vehicle/cargo deck (1,410m2). Additionally two lateral ramp doors are located on the starboard side and provide wharf access to the heavy vehicle/cargo deck for vehicles up to 65T. Vehicular access between the heavy and light vehicle decks is achieved via a fixed ramp located on the port side. The well dock is 69.3m long and 16.8m wide (1,165m2) and the LHD will normally carry four LCM 1E. An additional four RHIBs can be carried behind the LCM 1Es, however this will be mission dependant rather than a normal load out. The well dock has been designed to handle water craft of allied nations, including LCUs, amphibious vehicles and LCACs. The main accommodation deck is located above the well dock and heavy vehicle/cargo deck and includes crew accommodation, mess decks, medical spaces, galley facilities, office spaces, and recreation rooms. Accommodation is provided for 1400 personnel; approximately 400 ship’s company including the watercraft and flight deck crews and 1,000 embarked force personnel including the PCRF, embarked flight, HQ staff and landing force. The LHD will be jointly crewed with personnel from Navy, Army and the Air Force forming the ship’s company. The flight deck has been configured with six spots on the port side for medium sized aircraft such as the MRH-90 or Blackhawk, which allows for simultaneous take off and landing operations; alternatively it can support simultaneous take off and landing operations of four CH-47 Chinooks. There are two aircraft elevators – one aft of the flight deck and one fwd of the island on the stbd side - that can accommodate medium sized helicopters, with the after one able to accommodate larger helicopters such as CH 47. Both aircraft elevators service the hangar and light vehicle/cargo deck and the fwd elevator is dual roled for stores and personnel. Between the flight deck and the accommodation deck is a contiguous hangar and light vehicle deck; the hanger (990m2) occupying the after section of the deck whilst the light vehicle deck (1880m2) is located on the forward section of the deck. The hanger can accommodate up to 8 medium sized helicopters with 18 medium sized helicopters able to be accommodated if the light vehicle deck is also used. Integrated Navigation System, including an integrated bridge, navigation sensors, AIS and WECDIS.